To understand Arsenal’s success we also need to understand what led up to the success. Between 1893 (when Arsenal entered the Football League) and 1930 (when Arsenal won their first major trophy – the FA Cup) was a period of 36 trophyless years. During that spell Arsenal reached one FA Cup Final, came second in the First Divison on one occasion, and were defeated in two Cup semi-finals. And that was it. To be fair for four of those years there was no League football because of the first world war, so we can say that was a period of 32 years. After that Arsenal won seven major trophies in nine seasons, and by 1953 had won the league more times than any other club. And yet despite such a huge period of success, between 1954 and 1968 was a period of 14 seasons – in which once again Arsenal won none of the major trophies. Pretty small beer compared with 1893 to 1930, but for those of us who remember even a little part of that era, it seemed forever at the time. So we can conclude that Arsenal regularly has periods of time without a trophy: the early years before Chapman, the era after the Chapman Dynasty (Chapman-Shaw-Allison-Whittaker, all of whom had been at the club in 1925), the pre-Graham era, and the period of paying for the Emirates Stadium. It might not be nice, it might not be fun, but that’s how it is. It is often said that history is written by the winners, and that is probably true, which undoubtedly explains the dearth of books on Arsenal’s lean years. After all, we all want to read about triumphs, not about being “almost there” but not quite. And yet there is every reason for the history of the leaner times to be written in the same detailed way as the history of victories, both to give us a complete history of Arsenal, and to help us understand how the next success came. For just as it is hard fully to comprehend the sudden burst of success that Arsenal had in the 1930s without knowing about the years before, so it is nigh on impossible to fully grasp what happened at the start of the 1970s without appreciating the period before it. This is why the volume Arsenal: The Long Sleep 1953-1970 by John Sowman is so important. Starting with the moment that Arsenal, on the last day of the 1952/3 season, won the League for a record 7th time, it charts Arsenal’s decline both match-by-match and through the reaction of the media and the public, as Arsenal followed up that record breaking championship season by coming 12th in the league and being knocked out of the FA Cup by Norwich City of Division III (South). Perhaps most importantly, this volume takes us through a shift in Arsenal’s perception. We had had Chapman, Allison, Whittaker – none of these had been players of major significance, although Chapman had played for Tottenham and Whittaker had a few games for Arsenal after the first world war. But now the club changed its approach and turned to ex-players of note. First Crayston, before we had Swindin, the man who had been in goal for most of the 1953 title winning season, and yet the club went backwards. Why? Until now, anyone interested in this question would have had to make do with a few lines dotted here and there within the numerous histories of our great club, but an in-depth analysis has been missing. Now here it is, and as well as the detailed analysis of the games, transfers and behind the scenes moves, there is more insight into the fall of Swindin to be gleaned from one page (page 180 if you are interested) than anything I have read anywhere else. And reading that section on the sacking of Swindin but keeping him in office for another two months, and the appointment of Billy Wright long before he could take over Swindin’s office, reminds us of the way Manchester City have just handled their latest managerial change. Maybe some of today’s directors of football clubs ought to read this book too, when they come to move a manager on. Just to know the pitfalls. But then another question arises. We know that there is a modest sized group of people who proclaim themselves to be supporters of Arsenal, but who seek a total overthrow of the current regime, from the youngest trainee to the manager and beyond. Now I think I know my Arsenal history, but I must admit that for me it was a shock to read how Swindin was treated at the end of his managerial time. And a shock to learn that the Arsenal chairman of the day told Billy Wright in his first few weeks in his first job as a football manager that he should sign Joe Baker, if that was the player he wanted, and “pay whatever it takes”. Of course we know what happened. Joe Baker did indeed score goals (93 in 144 league games – a superb record), and yet the team didn’t flourish, finishing 7th, 8th, 13th and 14th in Wright’s four years with the club. Worse, on 5 April 1966, 8738 turned up for the home game against WBA. One month later the Highbury crowd was down to 4,554. It is thus with huge relief that we finally come to Bertie Mee’s tenure, and although the book does of course deal with the two league cup final defeats it ends on the most upbeat of notes – with the Fairs Cup win in 1970. So relief that (as we all know) it all turned out fine in the end. But… this book also leaves us so much wiser, as for the first time we can understand exactly what went wrong, how it went wrong, and why it went wrong. These are important lessons. Appropriately the cover of the book has a dramatic picture of Bob Wilson leaping in the air to celebrate the winning moment on the pitch in the Fairs Cup, and Bob’s foreword to The Long Sleep really does spell out what that moment meant to the players. That introduction by a man who surely all of us hold close to our hearts, really is the icing on the cake. To me, this book is a massive achievement – taking a subject which is itself a period of failing to win things, and exploring the whys and wherefores all the while skillfully leading us to that final moment, when everything was all right once again. To those of us who were far too young to have witnessed Whittaker’s final triumph (remembering that at that moment Arsenal had won more league championships than anyone else) the Billy Wright years seem to be saying that Arsenal might never win anything again. But the wheel had turned, and we were back. This volume is the one and only place where anyone interested will be able to learn quite how and why the club slumped so far, and took so long to recover between that record breaking seventh championship and the Fairs Cup triumph. To my mind, the lessons revealed in this book should be read, understood, and never, ever, forgotten. Arsenal: the long sleep, 1953-1970 by John Sowman, with an introduction by Bob Wilson, is published by Hamilton House, as is available both as a 375 page printed volume and as a Kindle book via Amazon. 3 comments to To understand Arsenal’s success we also need to understand what led up to the success. I have just finished reading the Kindle version of The Long Sleep, which I found to be a thoroughly enjoyable and a fascinating read. The period written about, allows me to wallow in nostalgia, (something us oldies like to do). As the book relates, to the time I started to go regularly to watch and support Arsenal both at Highbury and later going to away matches. I remember well some of the matches and the players detailed in the book. The first league game that I went to at Highbury is highlighted in the book, the final game of the 1958/1959 Season, which was played as an evening floodlight game v Birmingham City, the original game being postponed because of the tragic death of the Birmingham full back, Geoff Hall from Polio. Arsenal had to win the game to finish 3rd in the 1st Division to qualify for ‘Talent’ money payment. Arsenal won the game 2-1 and to this day, I can still recall Danny Clapton scoring the first goal with a cross shot from a precision pass behind the full back followed by a close range header from Vic Groves. Fast Forward to the 1969/1970 season, it has been said by many people, and believe me, it is true, there has never been a game or atmosphere that there was at Highbury for the Anderlecht game, you had to be there, words cannot describe the emotion and joy in winning that cup in bringing the glory days to Arsenal. I highly recommend this book to all Arsenal followers; I defy anyone not to enjoy reading about this period in Arsenal’s fantastic history. You are both so right. It is a magnificent book (I have the paperback version) and it is those very years when I was growing up. I lived and breathed Arsenal and wallowed in the club’s history and Tom Whittaker’s autobiography was a treasure to me. 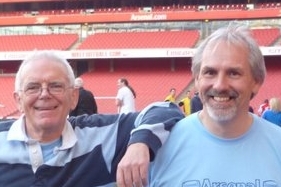 We lived in the country with no league football clubs very near to us and as my Dad was an Arsenal fan I followed him. My uncle was a Spurs fan and it was him who took me to see my first game at White Hart Lane in 1959 when Arsenal won 4-1. Even my uncle was pleased for me. To see my heroes such as Jack Kelsey, Vic Groves, David Herd and Tommy Docherty made it one of the most memorable days of my life. This book is very well written and so much information I didn’t know of. I have enjoyed reading a chapter a day and then looking up the many autobiographies and biographies of the different players and managers we have had to compare events. It is so well researched and a must read for any supporter who enjoys the history of our club. As I have posted before Arsenal’s successes have come in waves and in the periods in between is when a true fan still gets behind the team. Sure its fair to criticise and we all have our own ideas about how we should play and who to pick or buy but still support the club. When I was young there were Arsenal fans who were always moaning, sometimes justifiably, but even when success came would soon downgrade it. Unfortunately there are a lot of that sort now but those of us who lived through that time I think appreciate what the club has achieved more. The ones who first came on board at the height of our triumphs are the ones who easily get restless and expect it to happen all the time. We can be proud of what Arsenal have achieved and staying in the top four all these years with the bank rolled opposition clubs has been difficult and it would be good for those type of fans to read this book to see what hard times are really like. Remember too that even then our hard times would still have been the envy of many other clubs. So thank you to John Sowman for bringing history back to life in a brilliant book, Bob Wilson for his foreword and Untold Arsenal for their part in getting it published. Thank you Old Geezer and Nigel. I do believe that you see my book for what it is – something totally different to all the glory tomes that regularly fill the shelves of bookshops. It is a realistic warts and all account of life at a major club when things don’t go as planned. That is when the real supporter comes into his or her own. I remember only too well the disastrous cup defeat at Peterborough on the day that Winston Churchill was buried. I remember seeing a couple of ten or eleven year old lads crying their eyes out sitting on a wall near Peterborough railway station, with the local kids taking the p**s out of their misery. I wanted to console them but I just hadn’t the heart to talk to them, I was so gutted myself. I wish now I could have. I hope they stuck with us and lived to see the better times of five years later and beyond.